It’s October. The darkness is creeping up on us inch by inch. One of the best countercurses is to use bright yellow-orange-red inks as lanterns. I took out six yellow-orange-red inks and doodled away in the dark October evening. 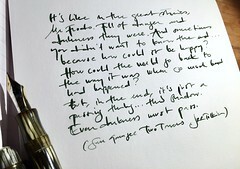 The inks are Diamine Sunshine Yellow – my preferred yellow that I even use as an highlighter; Stipula Saffron – a bit more orange than the Diamine Sunshine; Irohizuku Yu-Yake – an orange-red that is darker than i remembered and it shades exquisitely; J Herbin Orange Indien – a nice, lively orange, but it pales in comparison to the three above mentioned; J Herbin Ambre de Birmaine – more golden brown than yellow, but a golden alternative to sepia; Iroshizuku Fuyu-Gaki – a vivid autumn leave orange that suits the season. This entry was posted in inks, pens and tagged aurora, diamine, fall, fountainpen, fountainpens, ink, iroshizuku, j herbin, stipula, yellow. Bookmark the permalink.